The National Museum has a variety of displays covering all of Egyptian history. 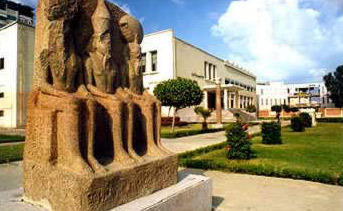 The Museum, which was opened in Port Said in 1987 has exhibits on the 1st floor covering prehistory and the pharaonic period, including several mummies and sarcophagi along with various statues and other artifacts. On the next floor is Islamic and Coptic material, including textiles, manuscripts and coins, as well as artifacts from the Khedival family. The museum is open from 9 AM until 4 PM, but usually closes for lunch.